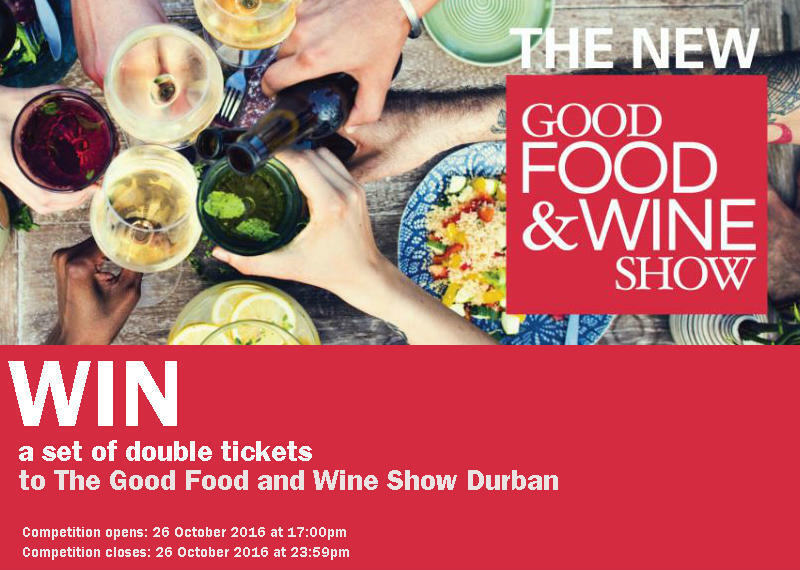 Stand a chance to win a set of double tickets to the Good Food and Wine Show Durban! 5 winners will each receive a set of double tickets to The Good Food and Wine Show in Durban. 1.1. The Afternoon Express Good Food and Wine Show Competition (Competition) will be run by Cardova Trading (Pty) Ltd (Organisers/we/us/our). 5.1. 5 (Five) winners (Winners) will be selected randomly by means of an automated system from the valid entries received within the Competition period, by 12h00 on Thursday, 27 October 2016. 5.2. We will contact the Winners between 12h00 and 17h00 on 27 October 2016 on the cell phone number from which the entries were sent. If a Winner is not contactable within the aforesaid period, and after we have made at least 3 (three) attempts to contact the Winner, that Winner will forfeit the prize and we shall have the right to select a different Winner on the same conditions except that we shall only be required to make 1 (one) attempt to contact each further Winner drawn. 5.3. Winners will be required to provide a copy of his/her Identification Document as required in terms of the Consumer Protection Act, 68 of 2008. If the Winner fails to provide a copy of his/her Identification Document within 12 (twelve) hours from being requested to do so, that Winner will forfeit the Prize and shall have no claim against us. 6.1. The 5 (five) Winners will each receive a set of 2 (two) tickets to the Good Food and Wine Show Durban taking place from 28 to 30 October 2016 at the Durban Exhibition Centre. 6.3. The Prize does not include any travel costs or arrangements. The Winner is required make his/her own arrangements to attend the Good Food and Wine Show at the Durban Exhibition Centre, KwaZula Natal at his/her own cost.